The banks of the eastern section of the River Thames are home to many of London's most interesting areas. It's here you'll find stunning Greenwich, just 6 mi downstream of Tower Bridge, the traditional London base of the Royal Navy and home to the largest expanses of preserved historic architecture and parkland in England. Across the river, on its northern banks, is the revitalized Docklands, easily accessible by the excellent Docklands Light Railway. Once bustling with ships travelling to and from the far-flung corners of the British Empire, it's a different kind of trading that goes on here now. Today, the Docklands area has been transformed into an international place of business and sightseeing with modern business premises, hotels, recreation areas, and housing. The Cutty Sark - the last of the 19th century tea clippers that once sailed between Britain and China - was built in 1869 and was the finest and fastest ship of its day. Laid up in Greenwich in 1956, it's now part of a superb museum that includes an interesting collection of old ships' figureheads, prints and drawings, as well as mementos of its many voyages. A new component of this tourist attraction is being able to walk underneath the vessel for a barnacle's view of its magnificent hull. No visit to Greenwich should omit the Painted Hall and Chapel of the Old Royal Naval College. The College stands on ground once occupied by a palace belonging to Edward I and later Henry VII and was where Henry VIII was born, married Catherine of Aragon and Anne of Cleves, and signed the death warrant of Anne Boleyn. A new palace was completed by Wren in 1696 for Charles II and soon after became a hospital for disabled seamen. Notable features of the Chapel are the altarpiece ("St Paul's Shipwreck") by Benjamin West and the round pulpit, lectern and font, made of wood from the old dockyard at Deptford. It's also where you'll find the Discover Greenwich Visitor Centre with its exhibits showcasing over 500 years of maritime history. A Palladian mansion designed by Inigo Jones, Queen's House is a masterpiece of Classical architecture and is notable for its symmetrical proportions and fine marble floors, as well as its wrought-iron balustrades and carved and painted ceilings. Begun in 1617, the house had been commissioned by James I but wasn't completed until 1629. With Greenwich Park as its garden, Queen's House epitomizes the entire art form of royal residences and is considered the first Renaissance building in England. Today, visitors can also enjoy the property's superb collection of fine art. The impressive collection of the National Maritime Museum - the largest of its kind in the world - illustrates the history of the Royal Navy from Tudor and Stuart times to the Napoleonic Wars. Housed in the two wings of Queen's House, the museum opened in 1937 and contains superb seascapes by William Turner, as well as portraits of famous seamen by Joshua Reynolds and Thomas Gainsborough. Of special interest to kids is the huge interactive world map used to display details of some of the most famous events in naval history. Other highlights include displays related to the Arctic convoys of WWII, Lord Nelson and the East India Company. The 183-acre Greenwich Park was laid out for Charles II to a design by Louis XIV's landscape gardener. The oldest of London's eight Royal Parks (it can trace its roots back to 1427) Greenwich Park contains many beautiful gardens and walking paths. Contained within the grounds, visitors find the Wilderness with its wildlife, as well as the Old Royal Observatory and the Prime Meridian Line. The views toward the city and the River Thames are wonderful, particularly at sunset (don't be in a hurry after the public address system announces the park's closure - instead, take the longest route back down to the river). Adjacent the park is the Ranger's House, home to the Wernher Collection with its displays of jewelry, glassware, silver and paintings. The Royal Observatory, founded in 1675 by Charles II to promote safer navigation, was housed in Flamsteed House - designed for the purpose by Sir Christopher Wren. Then in 1967, it moved to Herstmonceux in Sussex. 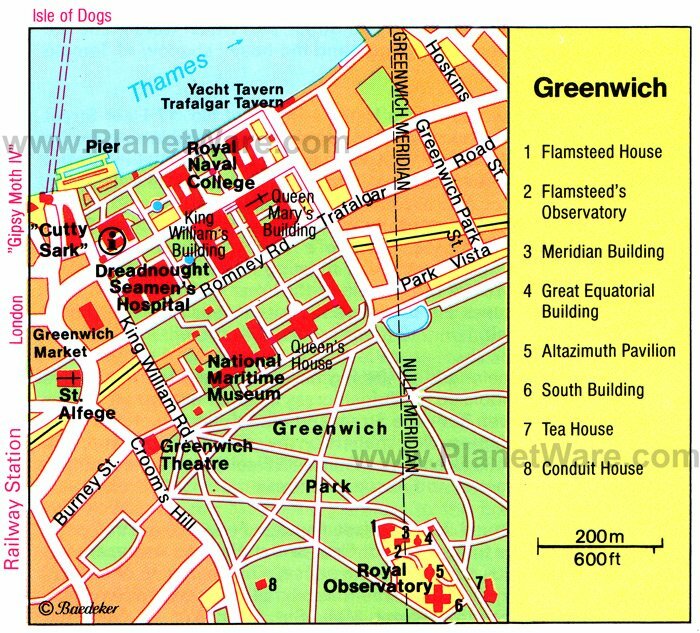 Today, Flamsteed House contains a collection of old astronomical instruments in the Astronomy Centre. On a mast topping one of the towers is a red time ball that drops at 1pm every day, a device originally intended to enable vessels in the river to regulate their chronometers. The zero meridian of longitude, dividing the world into eastern and western halves, runs through the Meridian Building, and is marked by a steel rod in the floor. A huge dome dominates the Equatorial Building, which houses Britain's largest telescope and the excellent Peter Harrison Planetarium. The Thames Barrier was constructed across the river near Woolwich 8 mi east of Tower Bridge in 1984 to prevent flooding upstream. This technical masterpiece, 569 yards wide, is the world's second largest movable flood barrier and sits atop huge piers supporting the steel gates that keep floodwaters out. While visits to the actual barrier aren't permitted, there are good views from a riverside walk and the Visitors' Centre has interesting displays concerning the construction and functioning of the barrier. Firepower, the Royal Artillery Museum, features everything from 14th century wrought-iron guns to modern-day nuclear missiles. More than just a large show of guns and weapons, the museum traces the history of firepower, including life on the battlefield. Galleries include an interactive zone for kids. For those seeking gentler pursuits, the nearby Fan Museum is devoted to the fan as piece of art rather than just a piece of equipment for keeping cool. Decorative and colorful, some fans date from the 11th century. Greenwich Market is a vibrant arts and crafts market dating to the 1830s. While once just a produce market, it now also houses a range of goods including antiques, arts and crafts, collectibles as well as food stalls. This covered market also hosts an occasional farmers market, and many cafés, restaurants can be found close by. Formerly known as the Millennium Dome and constructed as a celebration of the year 2000, the O2 has since evolved into one of London's top entertainment and concert venues. Today, the massive dome-shaped structure incorporates a music club (indigO2), the world's busiest concert hall (the O2 Arena), 11 movie screens, exhibition space (the O2 bubble), cafés and restaurants, as well as excellent views of Greenwich and both banks of the Thames. The best views are from the superb Up at The O2 attraction, a thrilling 624 ft walkway stretching across the building's roof and with a spectacular viewing platform halfway along. St Katharine's Dock s, once considered a slum, is now one of the hippest areas of London's revitalized East End and has managed to keep much of its original character. Old warehouses were converted to dwellings; the Dock Master's residence, the Dickens' Inn (1800) and the Ivory House - originally a store for ivory constructed in an Italian style - were all renovated. New buildings are concealed behind old facades, and a food market was recently started. St Katharine's Dock is ideally located beside Tower Bridge, the Tower of London and Tobacco Dock and makes a perfect place to get away from the crowds as part of a fun riverside. The Museum of London Docklands is located in the old Georgian warehouses on the north wharf of West India Docks, the Isle of Dog's last multi-story warehouses from that period. The Museum explores the story of London's river, port and people from Roman times to the recent regeneration of the Docklands, and its many galleries feature fun hands-on displays targeted to children. The highlight of Isle of Dogs is Canary Wharf, the most ambitious development in the Docklands. This self-contained mini-city covers 69 acres and consists of a multitude of towers for financial institutions, with Canary Wharf Tower being the tallest. The area is interesting to stroll around and contains many cafés and restaurants, as well as Island Gardens Park, a pleasant three-acre waterfront green space. The views of the Cutty Sark, the National Maritime Museum along with Greenwich Park are phenomenal, and a unique pedestrian tunnel under the Thames can take you there in just a few minutes. The Pumphouse Educational Museum is housed in a building once used to regulate water levels in the docklands. The museum consists of the Rotherhithe Heritage Museum and the Lavender Pond and Nature Park, and covers a wide range of topics from life in the 20th century to Roman artifacts. St Anne's Limehouse, built between 1712 and 1724, is the principal church of the Docks of London. The creation of Nicholas Hawksmoor, a student of Christopher Wren, it was restored in the mid 1800s and remains one of the landmark attractions in Limehouse, thanks largely to its having the highest church clock in London. The Geffrye Museum presents furniture and household objects of the 17th to 20th centuries in the former poorhouses of the Ironmongers' Company. Each room is furnished to represent different English styles from middle class homes complete with furniture, textiles, paintings, decorative arts, and other household items. There are also period gardens, and an excellent walled herb garden. The Geffrye Museum's Learning and Education Centre contains a library on relevant subject matter, and also presents a variety of programs and workshops. Eltham Palace is one of England's most stylish 1930s country houses and is built on the site of a former 14th century palace inhabited by Edward IV and Henry VIII. Along with its superb Art Deco interior are the extraordinary gardens around the palace, as well as a moat planted with water lilies. Nearby Sutton House is also worth a visit and is a rare example of a Tudor red brick house. Built in 1535, its many early details are on display in rooms like the Linenfold Parlour with its Tudor oak paneled walls carved to mimic cloth. Modern and contemporary art is on display at the Whitechapel Art Gallery, designed by Charles Harrison Townsend and opened in 1901. It has developed an international reputation as one of the key galleries of modern art, and is famous for having premiered world-class artists such as Pablo Picasso and Jackson Pollock. In addition to its stunning art exhibits, it also hosts many lectures and films. InterContinental London - The O2: riverside luxury, Canary Wharf, floor-to-ceiling windows, multiple restaurants, wonderful spa. DoubleTree by Hilton Hotel London ExCel: mid-range pricing, water views, warm cookies at check-in, well-equipped fitness center. Novotel London Greenwich: affordable rates, modern rooms, hammam, fitness center. Point a Hotel, London Canary Wharf: budget hotel, great location, friendly staff, compact rooms with comfy beds.